I wasn’t going to. You know, since it’s not like I have anything to say that hasn’t already been said. But it’s everywhere, even over here. I subscribe to CNN and BBC news alerts on my phone. Those alerts used to be infrequent – only in cases of natural disasters and tragedies. I regularly would say that when an alert came through, you knew it wasn’t good news. Lately I’ve been waking up to three, four, five alerts and sometimes more every morning detailing the latest in the USA. They come in while I sleep, while North America is churning out news, and so my morning greeting is a tally of what I missed over the past eight hours. And no, it’s still not good news. 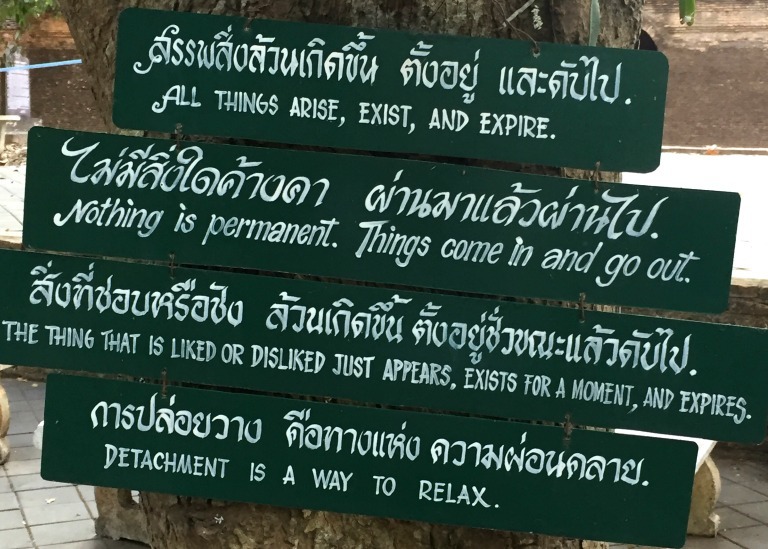 I’m living in Thailand right now — a country where I don’t speak the language and where I can’t read the script. I’m at the mercy of other people who are skilled at using my language to communicate with me. And when they can’t, I need to rely on other forms of communication, like a friendly smile and a game of charades. In these moments, I can make sounds but can’t speak. I can write out my wishes on a notepad but they can’t be read. I can stare at the symbols on a sign or a menu but can’t make sense of what I’m looking at. I am essentially mute and illiterate. But because I’m a tourist, not a refugee, because I’m fortunate to be a white, middle-class traveller from a Western country with a maple leaf on my backpack, I’m forgiven. It’s okay that all I can do in the local language is count to 10 and ask for the pork or the chicken. No one tells me to go back to where I came from. No one tells me that I don’t belong here simply because I can’t speak the language. No one tells me that my culture is barbaric just because it’s different. There is nothing more humbling than realizing you can’t communicate. And as a native English speaker, I frequently take this for granted because I can almost always find someone who knows my one and only first language as their second or third or even fourth. But sometimes, I’m forced to improvise, and it’s in those moments that I understand how frustrating and painful it must be for someone to settle into a new place where even the alphabet is a mystery. I live in Chiang Mai, a city full of expats, and so even though I came here intending to experience Thai culture, I naturally find myself being pulled to others who are like me. We share a common language and a common confusion in a place we’re still discovering. And as I’m absorbed into my own little community, I’m reminded of the neighbourhoods I know back in my hometown of Toronto: Chinatown and Greektown and Little Portugal and Little India — districts that formed because people wanted to be with others who understood them. All everyone wants is to be understood. For anyone who has ever spent any time in another land where everything is different, this seeking of the familiar is well known. For anyone who hasn’t left the borders of their own home, it may seem ominous. Threatening, even. After all, why would anyone come to a new place only to stay with their own kind? They must be scheming or plotting together. Or perhaps, they’re just lonely and lost. It’s weird being so far away as I watch my home continent fall into chaos. Part of me wants to just turn it all off, to cancel my news alerts and ignore the stories, and live an oblivious life in a place where I can’t communicate, but where that silence feels okay because at least people smile at me and show me kindness when I stutter out my best attempts at Thai. But the other part of me knows I can’t just ignore, that I have to remember that not everyone is as fortunate as I am, to be allowed to land in a new place and just be, with no one questioning why I’m here or why I can’t speak or write or read the language. I know that for those who fear what’s foreign, that fear is very real. And I don’t disrespect that fear even though I do believe it’s misplaced. And I know whatever I write here isn’t likely to change anything for them, nor am I trying to. I’m writing this for me because I know that with each trip I take, I learn a bit more about myself and who I’m meant to be. And with each effort to communicate and ‘fit in,’ I realize how much I still have to learn. Travel is incredibly powerful. It has the power to erase prejudices and build connections. It can make us realize how small we are in the world at large. It brings the best and worst of our personalities to the surface and forces us to examine who we are and who we want to be. It makes us face our demons and decide how much control we want to turn over to them. It forces us to be uncomfortable, and I know my greatest self-growth comes when I’m uncomfortable. But after four weeks of settling in and picking up a few Thai basics, I’ve realized more and more that reading and writing and speaking are just the tools to make me feel more comfortable here. They’re a piece, but not the whole puzzle of what it means to feel at home in a new land. That’s because true understanding and connection don’t come from what we’ve learned to do, but from what we’re willing to try.